I know I've said this before, but THANK YOU for supporting our new book Lion City Adventures. We had a great book launch party and the response since then has been unbelievable. I’ve already received so many requests and suggestions for Book 2. All I can say is that we’re definitely working on it already. What’s it about? That’s still a secret. For now. 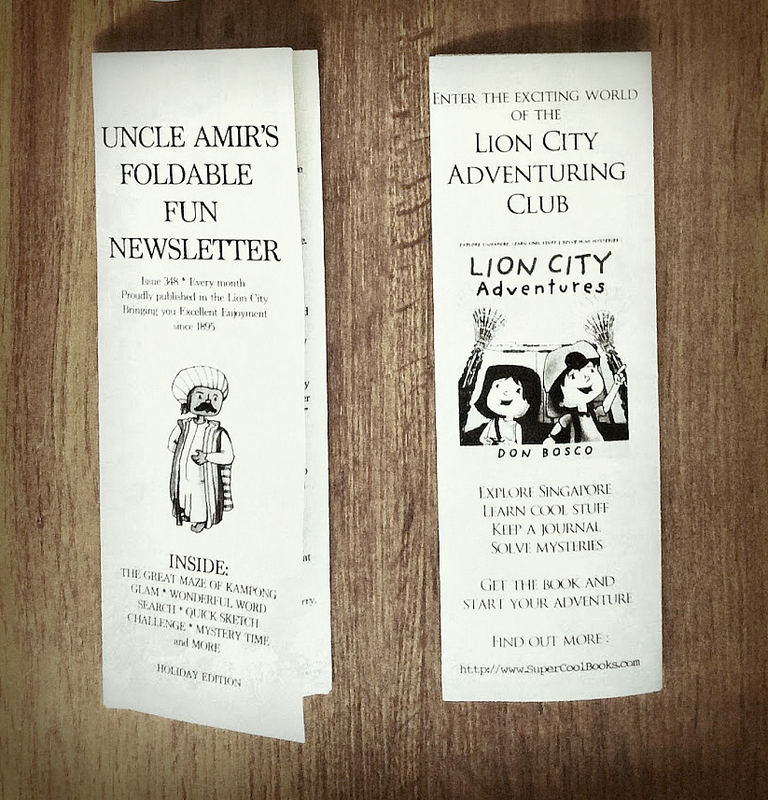 But we’ll be organising some exciting stuff with the Lion City Adventuring Club, so keep a look out for announcements. 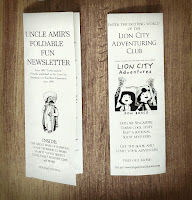 Also, if you missed the launch party, here’s your chance to get your own copy of UNCLE AMIR’S FOLDABLE FUN NEWSLETTER. 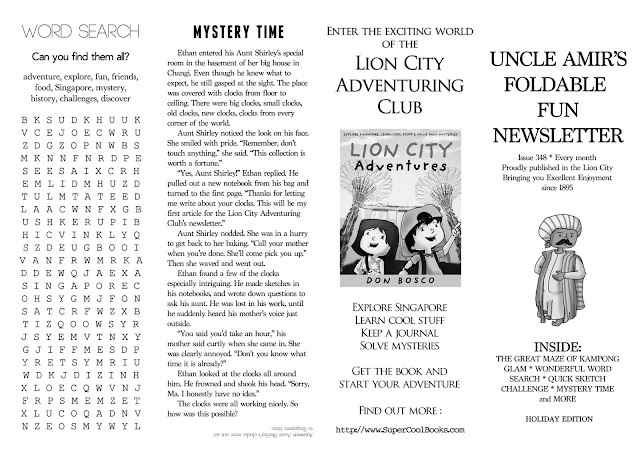 It’s set in the world of the Lion City Adventuring Club, and it comes with a maze, word search, Lion City Adventuring Club story puzzle, sketch section, a short quiz based on the information inside the book, and more. Just download this, print some copies on A4 paper, fold them into a slim pamphlet, and share them with your friends. Start your own Lion City Adventuring Club! And tell us about it on Facebook. We’d love to feature your stories. 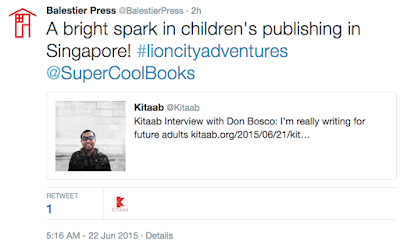 “Unlike history and travel books, Lion City Adventures is a very interesting read. It brings a contemporary outlook to places we’ve known all our lives. If you enjoy reading reviews of children’s books, especially those published in Malaysia and Singapore, you’ll find a real treat waiting for you at Thots N Tots, which has a terrific books section. This is a Malaysian family-focussed website founded by Brigitte Rozario, journalist and author of the popular Beebo picture book series. Brigitte wrote the Beebo stories about 20 years ago for her nephews. The books were so loved that MPH in Malaysia published them with new illustrations. We also interviewed Brigitte previously here. “But children eventually outgrow their younger selves. When they’re older and they look back, they’ll treasure the books that provided them with kind insights and sincere companionship. They’ll appreciate authors who explain the tricky bits of life in an honest and non-judgmental way — like what JK Rowling managed to do with her Harry Potter series. And that’s how certain titles become classics. They’re educational like that. Thanks to Felicia Low-Jimenez for putting this interview together. She’s 50% of the famous writing duo AJ Low, the other 50% is her husband Adan Jiminez, and they’re loved all over Singapore and some other parts of the world for writing the awesomely funny Sherlock Sam middle grade fiction series. Felicia asked some very good questions, which kept me up late at night as I thought about them and tried to express myself as clearly and honestly as I could. You can check out Felicia's books here. Kitaab is a website that explores all sorts of Asian literature in English, read their articles here. You can imagine how deeply moved I was to see this on Twitter. Balestier Press is a Singapore-London publisher specialising in Asian literature, everything from novels to picture books, and translated works too. Their books have earned acclaim and awards. You can check out their children’s catalogue here. + Lots more updates coming. Including a series of interviews with writers, illustrators and publishers I met at the recent Asian Festival of Children’s Content. Keep writing, keep believing in your talent. 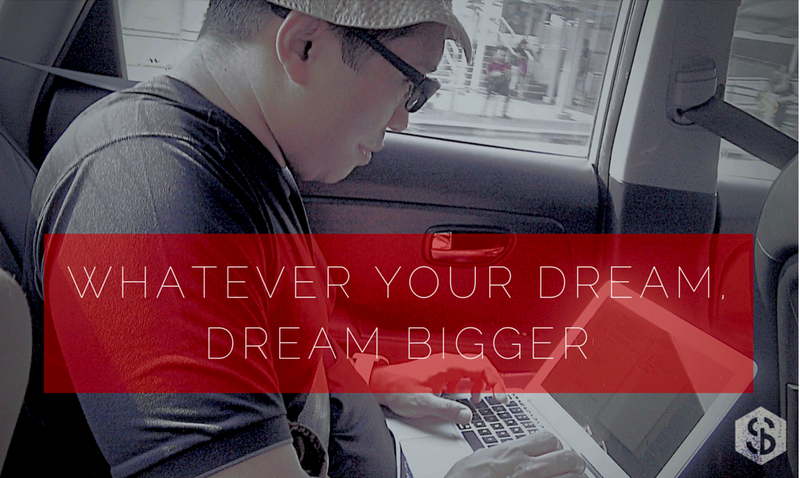 And whatever your dream, dream bigger!